The F Word is powerful and versatile_it's a noun, it's a verb, it's an adjective_it can do freaking anything! Maybe that's why it's so popular. 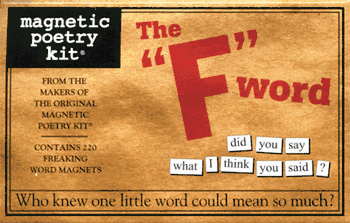 Of course, it's also offensive to some people and why the Magnetic Poetry F Word Kit comes in a plain brown wrapper. Inside that wrapper you'll find the F word and every variant of it. So if you want to write some powerful friggin' poetry or maybe just vent some steam, you'll find the words you need in this kit.